What kind of shape are your tires in? The national Highway Traffic Safety Administration has found that a tire which is at least six years old has increased chance of what they call “catastrophic tread separation.” That means a blowout and that’s certainly not something you want to ever experience. Over the years tires are exposed to intense amounts of heat and oxygen which break down the tires adhesive bond. That bond is what holds the different layers of the tire together and if that bond breaks down it only stands to reason that the tire will collapse as well. You can easily check the age of your tires by reading the D.O.T. Code which is imprinted on every tire. The last four digits of this code will tell you when the tire was manufactured. This is something you should really be on the lookout for especially when you buy a new car because you want to make sure you’re getting new tires as well. You should also keep an eye on the age of your spare tire because if that has become old it won’t do you any good if you need to replace another tire with it. If you swap out your old tires for a new set you might be able to leave them behind at your mechanic’s garage. However, it might be more affordable for you to do the tire replacement on your own. This will leave you with 2 to 4 tires that need to be properly disposed of. Although it might not look like it, a tire is considered hazardous material that can’t be thrown out in your weekly garbage pickup. The best course of action for an old tire would be to recycle it. A tire that is recycled is just like paper that is recycled: it’s chopped up and grinded until those small particles can be reformed into new material. In the case of tires that rubber is often used mixed in with asphalt which makes roads softer and quieter! The last thing you want to do is have an old tire sit around in the back of your garage. That tire becomes a nesting ground for all sorts of nasty critters and bugs. It’s also just going to sit there rotting in the sun and causing a stink. The worst-case scenario would be if that tire were to catch on fire. 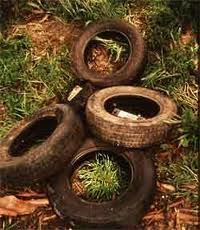 There are some dumped yard tire fires which burn for months releasing toxic fumes into the atmosphere. Not a pretty picture. When you’ve got tires that you want to recycle and dispose of then you should be thinking about calling up Junk King Kansas City. This professional hauling company is dedicated to removing all kinds of junk from all kinds of environments. Tossing a bunch of tires on the back of one of their trucks is no big deal to the Junk King crew. While they’re at it they can also remove any other junk or garbage you might have piled up around your home. Getting rid of those old tires could just be the perfect excuse to get your spring cleaning project underway! This entry was posted in junk king kansas city, Kansas City Junk Recycling, KC Junk Removal and tagged Get Rid of Tires, Kansas City Tire Recycling, KC junk hauling, KC Junk Removal, Tire Disposal on February 29, 2012 by Mike Stroud. Last updated August 2, 2017 .